THE LATE LATE Show’s London special was the most watched Late Late Show so far in 2018, attracting an audience of 610,000. More than half the people watching television in Ireland on Friday night tuned in to see the live broadcast (that’s 52% of the total share of viewers). The show was the first in 36 years to be broadcast from London, and celebrated the Irish in the UK, framed within the context of the Brexit vote. 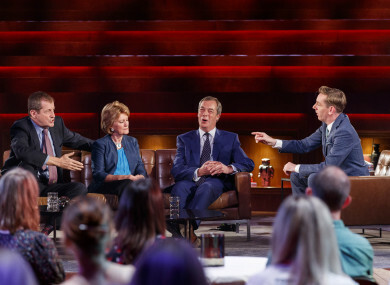 Among the guests on the show were BBC presenter Graham Norton and former Ukip leader Nigel Farage. During the show, Farage compared the UK’s vote to leave to Ireland’s 1916 Rising and the fight for independence. The audience peaked at 695,000 viewers and the show had a reach of 1.15 million people – that’s a measurement of those who tuned in for a minute or more of the broadcast over the course of the night. Email “Most Irish people watching TV on Friday watched the Late Late London special”. Feedback on “Most Irish people watching TV on Friday watched the Late Late London special”.